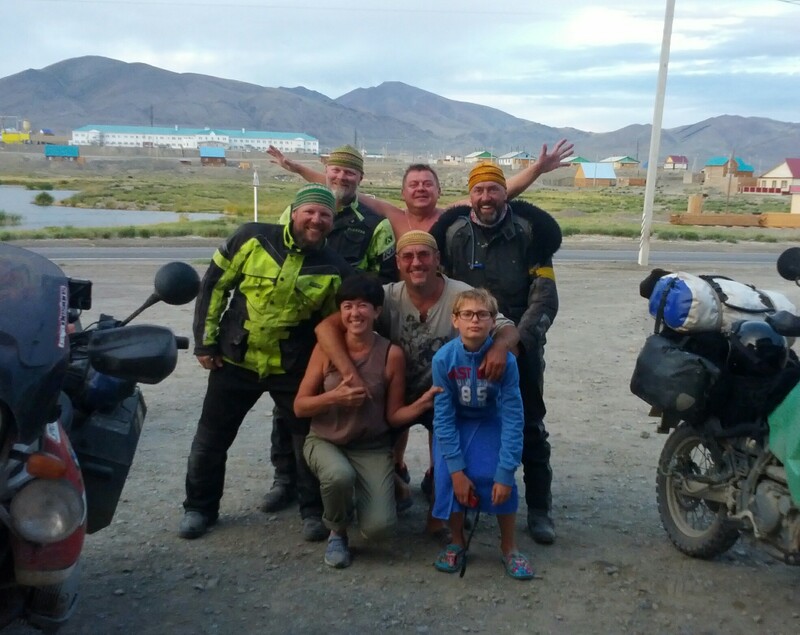 We came into Kosh Agats, looking for a guestinitza – ideally one with a Mongolia rally car or two outside. With Mongolia sim cards and a few tegreg left over, we’d be happy to donate them. Little Dom gave us his left over Tegreg and we wanted to pay it forward, to keep the karma going. Outside the tourist guestinitza there was a group of people having a drink. We got talking and we all got on very well. It started to look like it was going to be a belter of a night! When I got round to enquiring about a room it was fully booked 😦 We got directions to another place from a young lad who spoke his English, then said our goodbyes. Before we left the lady gave us all a hand knitted hat! They’re really comfy, and now that my hair is very short it’s perfect. All the guys were wearing them, like some kind of cult. It was very generous of them, so we reciprocated with gifts of our own – cards and pin badges. Nice!